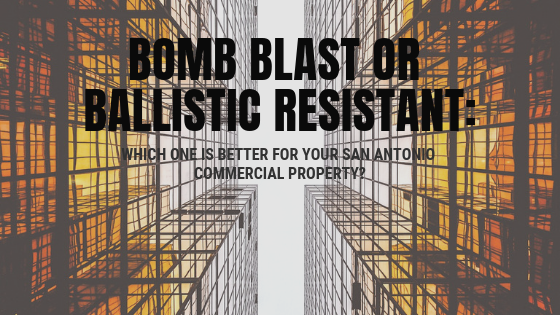 Bomb Blast vs Ballistic Resistant: Which One is Better for Your San Antonio Commercial Property? Commercial properties throughout San Antonio range from government buildings to large arenas that can hold tens of thousands of guests at any given time. The one thing these commercial properties all have in common is the need for premium security. When deciding what type of safety and security window film your property needs, it may be tough to decide between bomb blast and ballistic resistance. Both of these specialty security window films offer significant safety benefits but do have different traits. Bomb blast and ballistic resistant window film are both specialty security window film systems that require multiple layers of security film, an attachment system, and a glass strengthening agent. Bomb blast window film is designed specifically to better absorb the high impact caused by explosions. Ballistic resistant window film requires a thicker existing glass to be effective but is designed to better absorb the high impact from gunfire. Ballistic resistant window film is a more costly option than bomb blast but does have the added benefit of being both ballistic resistant and bomb blast protective. If you’re looking for both qualities, you’ll have to pick the ballistic resistant window film. Both options offer premium security but won’t stop a perpetrator from gaining access to your property– it’ll only slow them down. 3M™ Scotchshield™ Window Film Ultra Series Blast Test for San Antonio Commercial Properties from Kansas City Green Window Film on Vimeo. GreenLight Window Films offers industry-leading security window film installations across the country. We’ve worked with all different commercial property types and understand what works and what doesn’t. Security assessments provide better insight for us to give you product recommendations while enlighting property owners about the vulnerabilities and challenges they may face. We always provide a complete cost-benefit analysis as well. For more information regarding bomb blast and ballistic resistant window film, please contact us!